Striking and wearable short sleeves layered top. 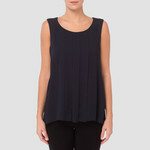 This chic top is a great staple piece for any wardrobe. It benefits from a scoop neckline and a short sleeve. 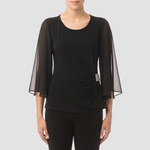 It features a layered look with the sheer overlay and a fitted piece beneath. Easy to dress up or down and is something a bit different with the textured geometric fabric.